Adventure Guide | What did I miss? 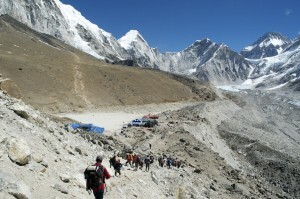 Having had a fairly emotional separation, the group left Phortse for the relatively long trek to Dingboche. It included, throughout the distance, a climb of 600m but because it was a longer linear distance none of the climbing was steep. 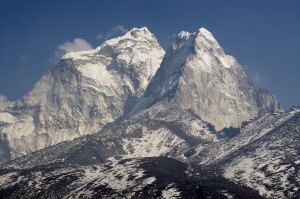 All the time, to spur them on, they had stunning Ama Dablam towering above them and getting closer all the time. By the time they reached Dingboche it was opposite the lodge and, although looked very different, was no less magnificent, particularly as the light changed on its dramatic surfaces. One or two of the group were feeling a little fragile, or tiredness was beginning to creep in, so they took the day at a leisurely pace in the knowledge that the next day was a “rest day”. 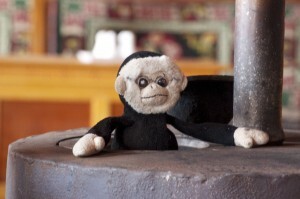 Monkey climbing out (or into) the yak dung burning stove! Since the start of the trip we had had daily nominations followed by the daily award. Nominations could be for anything that was said or done that caused amusement to the rest of the group, however innocent the words or act might be. The recipient of the award, then had to look after a stuffed monkey for twenty four hours, living with the knowledge that other members of the group might wish to kidnap or create some mischief involving the monkey. Failure to look after the monkey properly might incur a forfeit of some sort, designed at making the culprit feel as uncomfortable as possible. With me away from the group, they decided that they could relax the rules a little and have some fun. Hence, Monkey found himself the victim of a number of abuses and got himself into some very tricky scrapes. The rest day in Dingboche gave them time to apply their minds to some monkeying around! Apart from a morning stroll up the Pokalde ridge for enhanced views, it was a rest day and full advantage of the opportunity was taken in the afternoon. 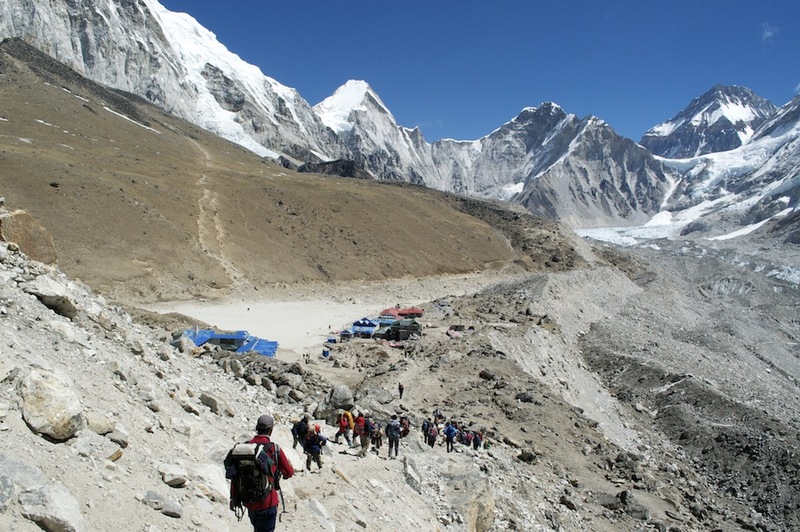 The following day saw them walk around the flanks of Pokalde to Dugla, a small hamlet positioned at the foot of the Khumbu Glacier’s terminal moraine. 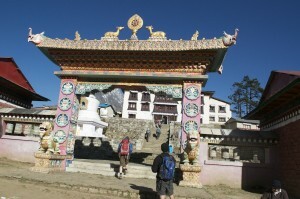 This part of the walk gave stunning views of Tawache and The magnificent Cholatse. From Dugla it was necessary to climb up the moraine to a ridge upon which there are many chortens commemorating the too many lives lost on Everest. Only the day before, one of the ice doctors had been killed in the icefall. 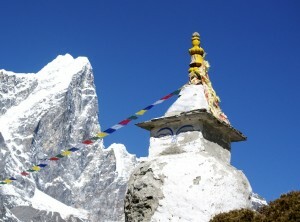 His home was in Dingboche. Stephen had come across his grieving widow. Soon there would be another chorten. Having climbed up to the top of the moraine it was a relatively easy, if not a high altitude walk, to Lobouche. I remember Lobouche as being very dirty, over crowded and quite unpleasant. If I am to believe the group it is now much improved. It was now beginning to get more serious. The altitude was beginning to impose limitations of activity and the trails, although still good considering the height, were less maintained. At least they were not encountering rows and rows of steps! From Lobouche it is only three hours to Gorak Shep, thus giving them time to walk to Base Camp and back to Gorak Shep, making it in total a long day. The walk to Base Camp no longer goes up the middle of the glacier but follows the moraine on the western side of the glacier. This makes it a tiring, undulating path which takes its toll on the energy levels. Robert had been suffering with an upset stomach for several days and had not been able to keep food in. How he managed to summon up the energy each day is remarkable, this day in particular. Base camp was beginning to establish itself with a range of brightly coloured tents in expedition clusters. Some of the larger tents with the base camp medical centre, the bakery, the Internet cafe and others would come once the climbers began to arrive. Looking across at the Khumbu Icefall, it is hard to imagine a route through there and the effort it must take to achieve it. What you come away with is a feeling that you have been somewhere very special. 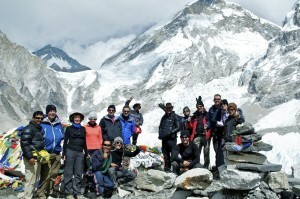 Back in Gorak Shep it was early to bed so that they all felt refreshed for the early ascent of Kala Patthar. Robert declined the opportunity on the grounds that he still had to get himself down. Also, Shona really only had ambition to reach Base Camp so took advantage of a lie in. The rest of the group set out at 4.30 and fairly raced up under the leadership of Bishnu who set a cracking pace. Usually it takes between two and three hours for the 500m ascent but it took the group less than ninety minutes, which was truly remarkable. Not content withe the lower most commonly visited summit, the group went to the higher (5643m) summit. 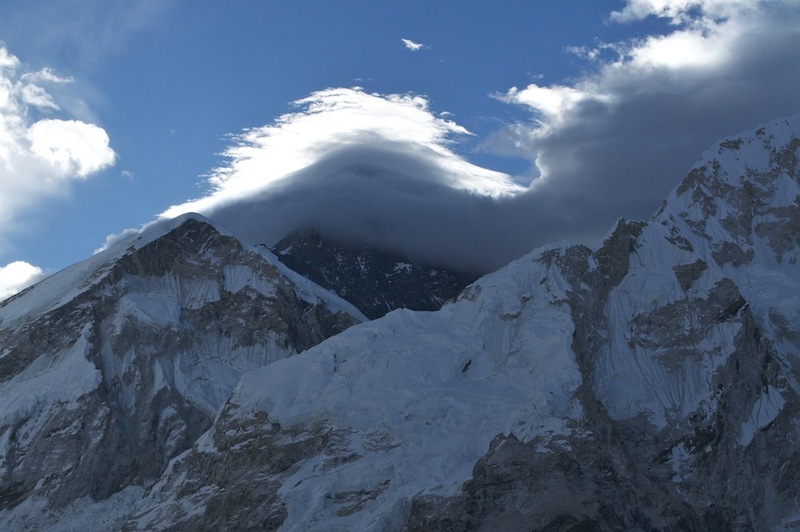 Sadly, Everest refused to show herself in her true glory, hiding behind a shroud of clinging cloud. 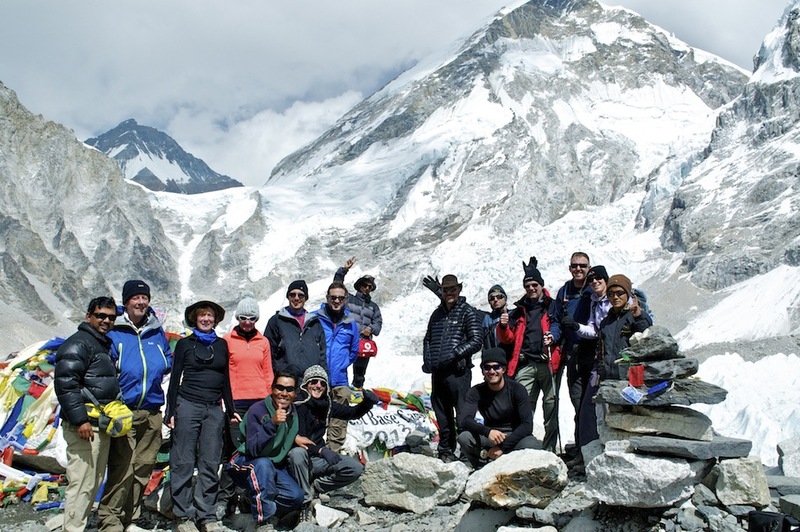 It was cold on the top of Kala Patthar, so half an hour was plenty of time on the summit before racing down to Gorak Shep for a satisfying and triumphant breakfast, after which they dropped down to Lobouche. That night there was a dusting of snow, giving a whole new perspective on the environment. Like all snow at this time of year it did not last very long once the sun came up. It evaporates rather than melts, leaving the ground beneath dry. There was a triumphant feeling among the group on the walk down to Debouche. They had succeeded in everything they set out to do. 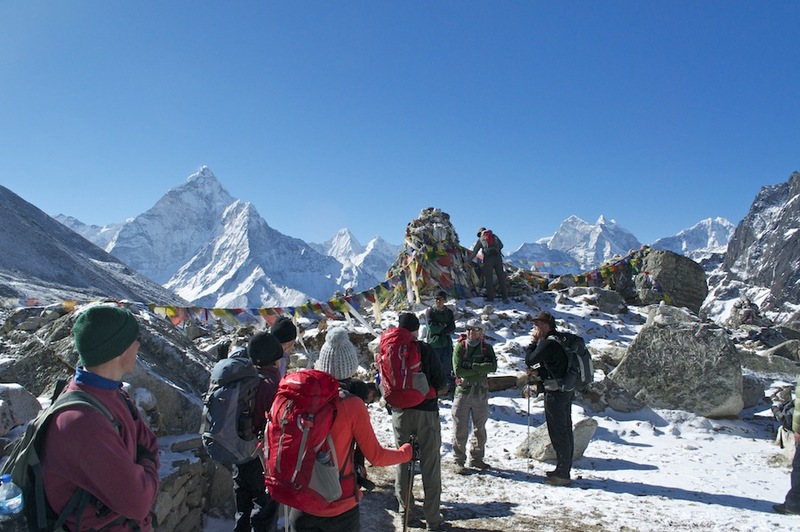 With the exception of the bit of cloud on Everest, they had had stunning conditions throughout. Now, also it was going to warmer as they descended. Every good reason to sing as they walked. While singing ‘I could walk 500 miles’ Nathan learnt the importance of breath control while singing at altitude. In his ambition to sing it properly he forgot to breath. Suddenly he felt light headed, then dizzy. Realising what was happening he uttered, “Oh, oh!”, walked a further couple of steps and then pitched forward in a faint. That night he was a very fitting recipient of the wally award. That night was also a top class lodge at Debouche, with excellent accommodation and food. Sadly Robert was not in any fit state to appreciate the latter. The next day was quite a long one. Firstly there was a gentle climb up to Thyangboche and the monastery followed by a long descent to Phinke Tenga, another climb and a traverse to Namche where they called in to Camp de Base Lodge, where it turned out I had left my sunglasses a few days previously. Guess who won the monkey that night and weren’t they eager to award it. Leaving Namche, they had the long, but much more preferable, descent of Namche hill before eventually meeting up, unexpectedly, with me in Monjo. That just about fills in the gap between me leaving the group and us meeting up again.